As humans, we once lived connected to the natural world. Now cut off from wild nature the outdoors seem alien to our everyday life. But nature is still there and calls to those who hear. And for those curious enough to seek her a world rich in wonder and mystery await. 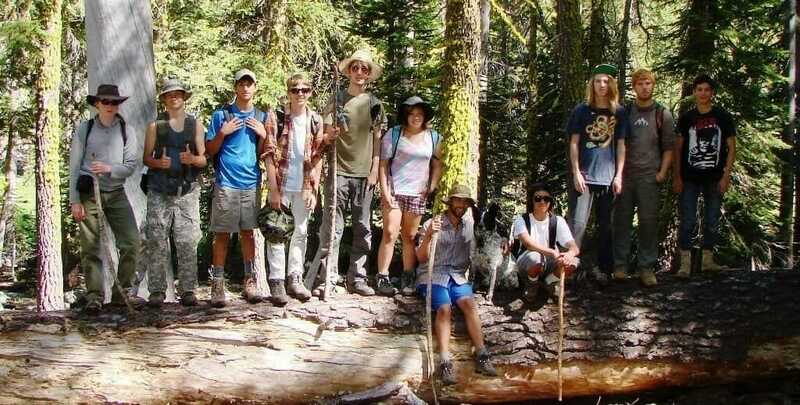 Join us this summer for teen wilderness adventure California. I was 15 when I first heard the call deep in the Canadian bush. The moon full and bright, the summer air sweet and rich. And in that moment the primeval song ran through me electric! Here in the wild the primal holds our imagination. It is here we have room to move and grow. I can think of no better place for your son or daughter this summer than to be out in it! In the wild. Challenging themselves, learning outdoor skills, growing, hiking, exploring, creating, learning. Outdoor camping adventures for teen’s 14-15. 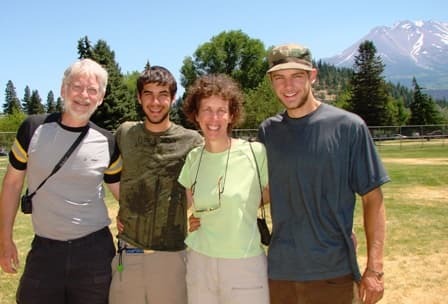 Teen Adventure Camps are held in northern California near Mount Shasta. Activities include hiking, backpacking, exploration, swimming, fishing, primitive skills, woodcraft, and animal tracking. Learning to be a human being in nature is an important skill for every teenager. As humans, we once lived as an integral part of nature. In modern times our natural instinct to play in the woods and fields have been hijacked by technology. Our teen programs immerse your child in the wonders of wilderness where they have an opportunity to reconnect with the natural world. To play, explore, build, make, wander, and move their younger selves in the way nature intended. Your son or daughter’s well being is important to us. We understand that being away from home for the first time can be difficult. Our staff do their very best to help your teen feel welcome and at ease. Over the many years of working with teens. Many teenagers who come to camp are very good cooks. This has been a wonderful surprise for us. so In the spirit of self-reliance, teens now will cook their own meals at camp. We supply the food, the teens take care of the rest. Our campers safety is the most important. Safety in all camp activities is an integral part of our program. We provide a supportive, caring, and welcoming environment to all. Parent’s, nature has taught me there is strength and wisdom in diversity. I have learned that nature does not care about the color of one’s skin or if we are male or female. Nor does she care from what background we come from or what language we speak. We are all part of the web of life. (three teenage boys, plus two parents) wholeheartedly recommend Mark Wienert’s tracking and camping experiences”. ~Dear Mark and Lifesong staff, thank you for offering an incredible wilderness immersion experience for my 16-year-old daughter this summer! My gratitude goes beyond words. This is such a significant developmental stage in my daughter’s life. I can tell that she has just been through a life-changing four weeks being gently guided in trusting nature, gaining a deeper appreciation of the earth that sustains us. While learning to discover and trust in her own inner strength and power while testing new edges. I can tell that she had a lot of fun, too, and greatly enjoyed the community of peers, counselors, and guides. I am amazed by the practical skills she learned, as well. On our next camping trip, it will be her task to make fire without matches! And she really did learn how to safely harvest food from wilderness if needed and how to keep herself warm and sheltered. As a teenage girl, learning survival skills in a supportive community has provided an invaluable opportunity for her to deepen her self-worth and become more grounded in her own true nature while taking courage to explore new edges. In today’s world of media and information overload and commercial pressure put on teens, I believe that any teenage girl would greatly benefit from the opportunity to participate in the kind of experiences offered by Lifesong. ~Dear Mark, I found the experience of spending a month in the wilderness very internally cleansing. Being away from the city and my daily routine, and instead spending time in such a beautiful environment with caring people, allowed me to slow down and completely let go of all stresses. I lived in the present. Every morning I woke up full of curiosity at what the day would hold, and every evening I fell asleep content. The longer I stayed up there, the more I appreciated the nature around me, and the more I grew to like the simple lifestyle. As I was leaving I found that all my material desires – whether for technology, a warm shower, or certain foods – had disappeared. They were unnecessary, even a burden. I would have been content sleeping on the ground and living off of Polenta for the rest of my life. I learned a lot, and had a great time doing it, whether I was swimming in pristine mountain lakes, cooking with the Dutch ovens, or covering myself in dirt for camouflage. The great staff made for a very warm and accepting community. In addition, I discovered a lot of strength, both physical and internal, within me, as I conquered challenges such as summiting the mountain after the two night overnight or making fire by bow drill. The staff is composed of head instructor – Mark Wienert, a graduate of the Tom Brown Tracker School. And Mark’s hand-picked student volunteers exhibiting outstanding leadership qualities. “Wilderness has a monumental transformative effect on our children. It is not enough for them to learn about nature only in the class room or a walk in a park. To know this deep and transforming experience a child must be immersed in wildness immersed in the sights and smells and sounds of nature. “Keeping children always confined to houses, buildings, cars, and heavy clothing will eventually cut them off from what life is all about. You take away all possibility for them to really feel the intensity of life…By encapsulating our children, we cut them off from the feelings of anything real, and we teach them to resist the forces of nature…If you are going to the beach, the woods, the swamps, or the wilderness, really get into it, roll in it, and get rid of all protection that will separate you from fully appreciating where you are. Become alive, not removed and insulated, and teach your children to do the same.” ~Tom Brown Jr. Talented and friendly teen staff at teen camp. Request an application for your teenager today! Sponsor a Teenager to Camp. 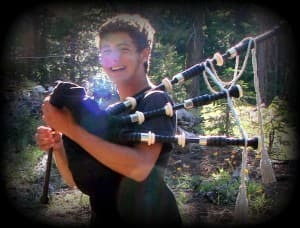 Sponsoring a teenager for a camp is a gift that lasts a lifetime. A special gift to that special loved one.